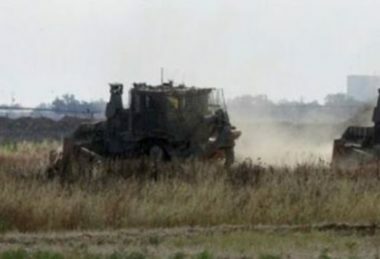 Israeli soldiers carried out, on Monday morning, a limited invasion into Palestinian agricultural lands, in northern Gaza Strip, while navy ships attacked fishing boats and opened fire at them west of Gaza city. Media sources said three Israeli tanks, and three armored D9 military bulldozers, advanced dozens of meters into Palestinian agricultural lands, northwest of Beit Lahia, in northern Gaza Strip. They added that the soldiers bulldozed sections of the lands, and installed sand hills, in addition to firing live rounds to force the Palestinians away. In related news, Israeli navy ships attacked many Palestinian fishing boats, and fired rounds of live ammunition, in Gaza territorial waters, in the Sudaniyya Sea area, northwest of Gaza city. Palestinian medical sources have reported that a man was seriously injured after an illegal Israeli colonist rammed him with his car, near Bethlehem city, south of occupied Jerusalem, in the West Bank. 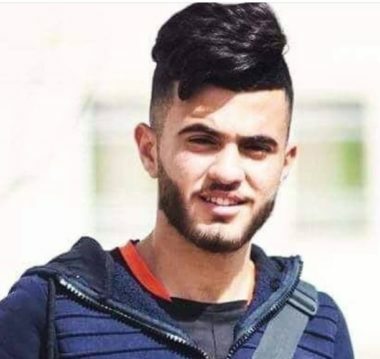 The sources said the young man, Hamza Shehda Najajra, was seriously injured, especially due to his head wounds, and was rushed to a hospital in Jerusalem. The Palestinian was struck by the speeding colonist’s car on the bypass road #60, linking occupied Jerusalem with Gush Etzion illegal colonialist bloc. Days Of Palestine [ Jerusalem ] – The Israeli occupation forces will impose a full closure of the occupied West Bank and the Gaza Strip during Tuesday’s general election. In a statement the IOF said that according to the security situation evaluation and directives of the political level, total closure will be imposed in the areas of the West Bank and the terminals of the Gaza Strip on April 9. The closure will be applied Monday midnight. According to the IOF, the Kerem Shalom commercial crossing and Beit Hanoun (Erez) crossing with the Gaza Strip will be closed. In the West Bank, Israel-issued work permits for Palestinian workers will be frozen, it said. The right-wing Likud party, which is led by Prime Minister Benjamin Netanyahu, and Blue and White political alliance led by Benny Gantz are considered the main rivals in the polls to elect members of Knesset (Israel’s parliament). The Israeli occupation army on Sunday notified Palestinian citizens of its intent to demolish eight homes in Masafer Yatta, south of al-Khalil in the West Bank. Local official Rateb al-Jabour reported that Israeli forces stormed the villages of ar-Rakeez and al-Mafqara in eastern Yatta and handed citizens home demolition notices. Four of these homes belong to three brothers and their sister from the family of al-Hamameda in ar-Rakeez village. They were also handed a notice ordering them to remove a mobile toilet. In al-Mafqara village, the Israeli army also notified two brothers from the family of Hamameda and a widow of its intent to remove four homes belongings to them. Two of these homes are a mobile house and a tent. 1) Organize or join an event or protest for the Palestinian prisoners. From today, organize demonstrations, actions and events and join in the Prisoners’ Week of Action from 17 to 24 April 2018! You can organize an info table, rally, solidarity hunger strike, protest or action to support the prisoners. If you are already holding an event about Palestine or social justice, include solidarity with the prisoners as part of your action. Send your events and reports to samidoun@samidoun.net.